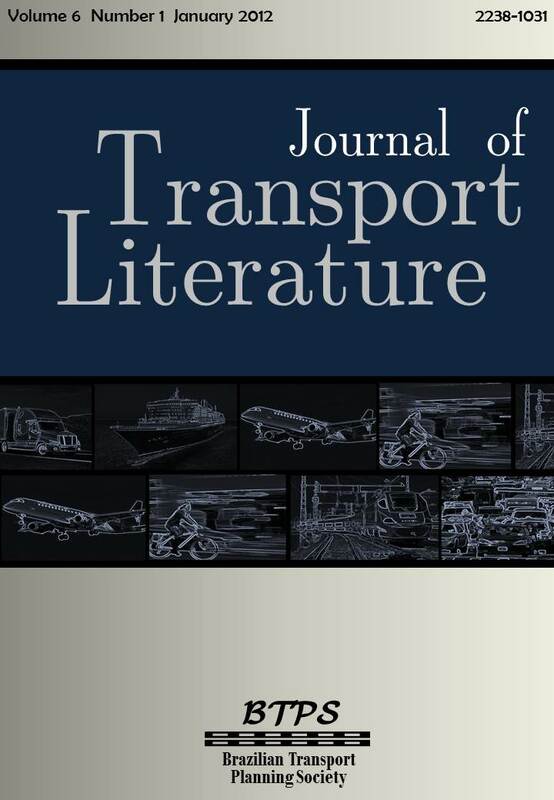 • Evaluating airport and seaport privatization: a synthesis of the effects of the forms of ownership on performance, by Bijan Vasigh*, Clara Vydyanath Howard [paper in English]. • Data envelopment analysis to evaluate temporal efficiency of Brazilian federal highways that take part on the highways grant program, by Guilherme Henrique Ismael de Azevedo , Marcos Costa Roboredo, Luiz Aizemberg , Juliana Quintanilha da Silveira, João Carlos Correia Baptista Soares de Mello* [paper in Portuguese]. • On how the connection of passengers at airports in São Paulo affects the fares available to São Paulo passengers, by Iara Paiva* [paper in Portuguese]. • Value of travel time and users idiosyncrasy of regular and irregular transport in Ceará: an empirical study by bayesian estimation, by Francisco Gildemir Ferreira da Silva* [paper in Portuguese]. • Application of simulation to obtain solutions to a traffic roundabout in the city of Manaus, Brazil, by Márcia Helena Veleda Moita*, Ely Sena de Almeida [paper in Portuguese]. • Has the expansion of car sales in Brazil any impact on the demand for buses? An econometric study of demand for commuting, by Jacqueline Elhage Ramis* [paper in Portuguese]. • How airlines decide the average size of airplanes in Brazilian market? Study of the determinants and projections for the next decade, by Thyago Silva Hermeto* [paper in Portuguese]. • Mathematical programming as a tool to assist in the management of an airline operations, by Marcelo Xavier Guterres*, Cláudio Sognálio Albano, Vera Lúcia Duarte Ferreira [paper in Portuguese]. • Perception of delay in rail transport in the European Community, by Thyago Silva Hermeto* [paper in Portuguese]. • The situation of airport infrastructure in the Northern region of Brazil and its potential support for regional aviation, by Cláudio Jorge Pinto Alves*, Frank Cabral de Freitas Amaral [paper in Portuguese]. • Wrap arond and IPO: alternatives to the Brazilian air transportation system development, by André Luís Macagnan Freire* [paper in Portuguese]. • Open skies agreement between USA and European Union: an overview, by Bruno Cardoso Vieira* [paper in Portuguese]. • Modernization of the port system in Brazil: a methodological proposal, by Simone Uderman, Carlos Henrique Rocha*, Luiz Ricardo Cavalcante [paper in Portuguese].